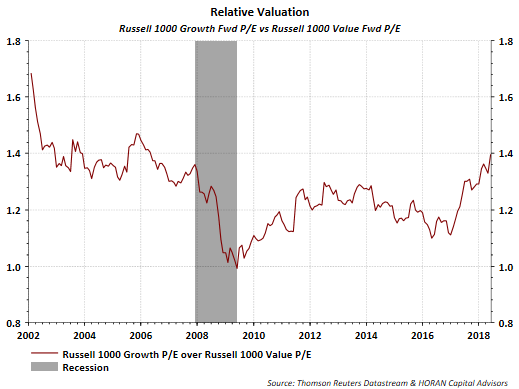 I believe one of the most difficult projections to get correct is drawing a conclusion about the growth versus value equity style. 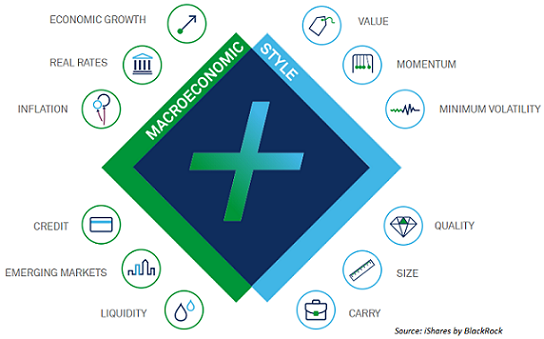 As the below image shows, there are factors associated with the economy (where is the economy in relation to the business cycle) and then specific factors related to stocks and bonds and getting most of these variable forecasts correct can be a difficult task. Nonetheless, I have written articles over the past few years regarding the growth versus value style. The 2016 analysis turned out to be correct as value outperformed growth in 2016. 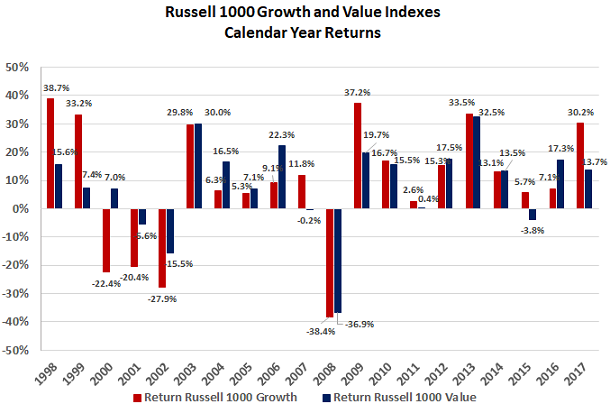 In 2014, growth and value returns were nearly identical as can be seen in the calendar year return chart below, but growth outperformed value in the following year. The below chart shows a longer view of the growth and value cycle. In the run up to the technology bubble in 2000, growth was the outperforming style, although value generated brief periods of outperformance like in late 1999. During the economic expansion that followed the bursting of the technology bubble and the lead up to the financial crisis in 2008, the value style had a sustained period of outperformance. The yellow highlight on the below chart represents the March 2014 article date noted above and where value had a brief period of outperformance. And finally, should an investor favor one style over the other. 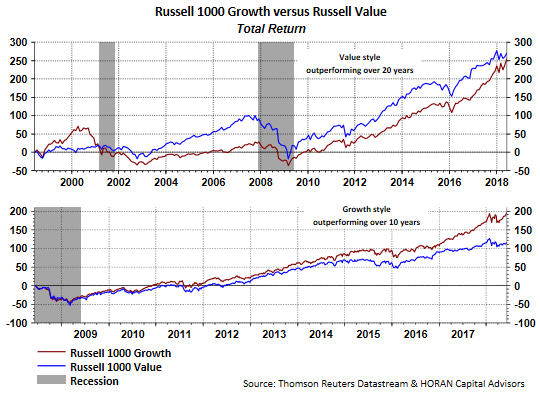 Over the long run value has outperformed growth. however, as seen in the calendar year return chart, value can go through periods of significant underperformance when growth is in favor. Value tends to shine in down markets and that is something for investors to think about. I will comment more on this in the conclusion. 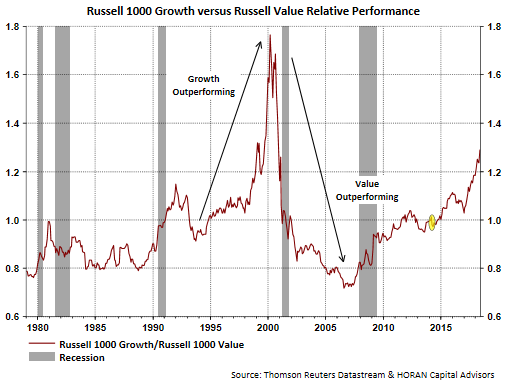 The below chart shows value versus growth performance over two distinct time periods. The top chart represents a 20-year time frame and the bottom chart represents a 10-year time frame. In short, the time frame over which performance is compared is important. Value is outperforming over the 20-year period while growth is outperforming over the 10-year period. Below is content taken from my March 2014 article in reference to growth versus value and where the economy is in the business cycle. "[one}...needs to understand the market fundamentals, ignore the noise, find relevant data to compare approaches, resist the chase for yield, and think for the long run. Most importantly, have a plan for a major market decline. Without one, you will never stick to your program." Jeff's complete article is a worthwhile read for other useful individual investor insight this week.